Box Text: DISCOVER THE MAN. UNCOVER A LEGEND. Experience one of the most revered game series of all time as you follow the perilous journey of Nathan Drake across a trilogy of thrilling adventures. 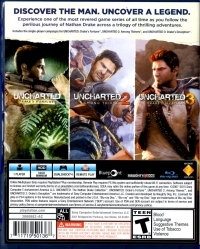 Includes the single-player campaigns for UNCHARTED: Drake's Fortune, UNCHARTED 2: Among Thieves, and UNCHARTED 3: Drake's Deception. 10-14-2015 currystorm Box Text DISCOVER THE MAN. UNCOVER A LEGEND. 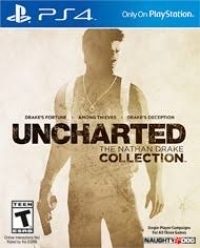 Experience one of the most revered game series of all time as you follow the perilous journey of Nathan Drake across a trilogy of thrilling adventures. 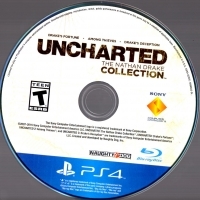 Includes the single-player campaigns for UNCHARTED: Drake's Fortune, UNCHARTED 2: Among Thieves, and UNCHARTED 3: Drake's Deception. This is a list of VGCollect users who have Uncharted: The Nathan Drake Collection in their Collection. This is a list of VGCollect users who have Uncharted: The Nathan Drake Collection in their Sell List. This is a list of VGCollect users who have Uncharted: The Nathan Drake Collection in their Wish List.